Welcome to The Photo Video Guy. I share news, reviews, opinions and tips to help you make better photographs and videos. We respect your privacy. Your email address is NEVER shared with others. Thank you for subscribing to The Photo Video Guy blog notification system! Please note that your subscription will not become active until you confirm your intention by clicking the link in the confirmation email. In this episode we cover news from Canon and Nikon, talk about a Leica sensor shortage, check out Lensbaby for mirrorless, empathize with Instagram fans, look at a cool Kickstarter project and have a short review on BlackRapid camera straps. The site of The Photo Video Guy featuring articles, reviews, tutorials and a podcast for your enjoyment and skills development. Looking for something in particular? Search all the posts for the content you are seeking! Subscribe to our articles via RSS by clicking the link below. Support The Photo Video Guy by ordering your own copy of ON1 Photo RAW through this site. Regular readers know that I am a big fan of Really Right Stuff products. Their customer service is superb. If you choose to purchase from them at their site, please let them know that I referred you. Every reader knows that I am a huge fan of Think Tank bags. 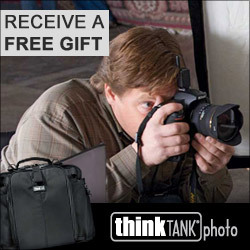 Help support The Photo Video Guy when you shop online for your next Think Tank bag! The Photo Video Guy is the creation of Ross Chevalier and is a division of Chevalier Media Group. Please feel free to link to your site, but please don't lift content without attribution.